Seneca Theatre was built in 1941 with a seating capacity for 911. It was originally owned by Famous Players theatre. The theatre hosted many events over the years, including the Canadian premiere of Marilyn Monroe’s film “Niagara” on January 28,1953. In 1984 Cineplex Odeon took it over and the theatre was twined into two cinema’s. Cinema 1, had 569 seats, Cinema 2, 211 seats for a total of 780 seats. A large, illuminated marquee was part of the original façade, the upper part of which still exhibits art deco styling. The interior was decorated throughout with native Seneca motifs such as birch bark-cast plaster walls, ceremonial masks and belt designs. The theatre is hoping to restore the masks and marquee in the not too distant future. The Seneca Queen Theatre today holds 308 comfortable seats, each with a perfect view of the stage, lots of leg room. We are fully licensed and offer both movies and live entertainment. We are also available for private rentals. DOORS for evening performances open at 7pm. 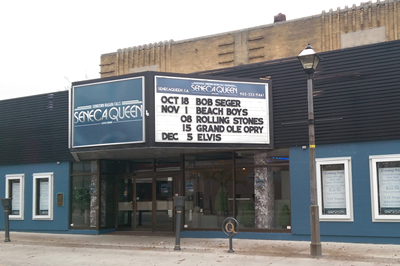 Seneca Queen Theatre is a smoke-free environment. Patrons are asked to refrain from talking loudly and to mute electronic devices, to respect our artists during the show. As a courtesy to those who express sensitivity to fragrances, we respectfully request that all patrons consider their fellow theatre-goers before using perfumes, after-shave and other personal care products.